Many years ago, the average kitchen was a drab and utilitarian affair. In these kitchens, people merely cooked and ate in them. These days, kitchens have gotten a lot more exciting. This room in the house acts as one of the home’s focal points. Now people want to add some creative spark to the room where the whole family gathers at the start and end of each day. 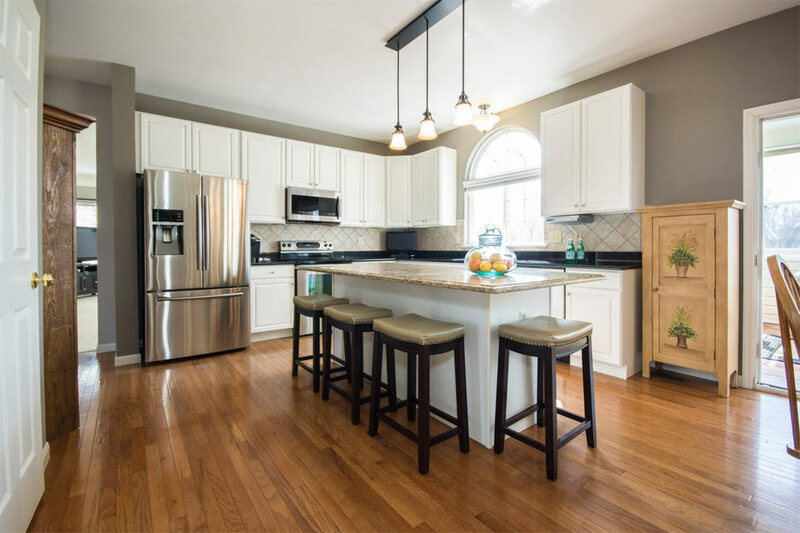 You will need to think long and hard about what you want out of a kitchen remodel before you subject your entire family to the upheaval of this process. The best kitchen renovators like to focus on open plan homes that set up the kitchen as the center of the residence. These days, simple and clean reigns as the design aesthetic of the day. This article will discuss five of the biggest kitchen design trends coming around the bend this year. You’ll get a better idea of the featured trend or two that can best fit your home kitchen. White cabinets have operated as a trend in the home design industry for a few years. Homeowners like the cleanness of the color, which can serve homeowners well if their kitchen space tends to get cluttered. Beautiful white cabinets can get featured in any type of kitchen. What many renovators do now to break up the monotony of white cabinets is to put in painted kitchen islands. Homeowners recently have gravitated towards gray cabinets in recent years. They like the versatile nature of the color. Pair your gray cabinets with glamorous accents or natural elements. Gray and white for cabinet colors will act as the go-to looks for kitchen design this year and beyond. But those who want to get a vanguard look for their cabinets should look at dark jewel tones such as plum, navy, black, or emerald green. Darker cabinets can make your kitchen appear luxurious. Darker cabinet colors will give your kitchen a dramatic and elegant look. Just make sure these colors don’t overtake the space and make it look dark, even in the light. Stylish homeowners will go toward these colors in the next couple of years. Those homeowners who want a high-end countertop should gravitate towards quartz. This material lasts a long time, is anti-microbial, and can get easily maintained. One problem that homeowners experience with granite, quartz’s closest competitor, is that they find granite a pain to maintain. Upon quartz’s arrival on the kitchen design scene, consumers worried about the material’s lack of choices in finishes and colors. But manufacturers stepped up to the plate and created more colors and patterns. Now homeowners can even purchase quartz that is designed to look like natural stone. These types of options have gotten extremely popular over the years. However, the trends tend to point towards more soft and neutral coloring. Some of the colors that homeowners have purchased in large numbers include taupe, gray, white and cream finishes. One thing that many homeowners hate is dealing with either a lack of space in their kitchen or too much space that isn’t being utilized. Shelves and drawers in most kitchens leave a lot of wasted space. What’s worse is that the space you have is either too small for the items you want to place there or too big for them. Kitchen islands have become the focal center of the modern-day kitchen. One trend that has come up is larger single level islands, which has multiple uses. This trend has become popular over the years because a lower number of homeowners are putting up cabinets on their wall. Kitchen islands need to make a statement as their size brings the visitor’s eye towards it. Today’s kitchen islands will feature cabinets that double as much-needed storage solutions for the homeowner. The island will also get fitted for different appliances. Lastly, you can have your family or guests eat and drink there as the most popular models can seat several people at a time. A lot of people now ask their renovators to extend their island into the living room. This tactic will work best for people who want an open home plan. When done this way, the island can operate as an integral part of the kitchen without taking up a massive amount of space. Animal lovers already know the importance of having their favorite pets near them as they cook dinner or pay the bills for the month. But the kitchen can act as a dangerous place for the family cat or dog if you’re not careful. When you have a baby, you babyproof the kitchen. But many pet owners don’t see the need to provide protective measures for their pets in their kitchens. One task you can do is create a feeding station for your pet. Place it in a kitchen corner where you can place food, toys, and other items that you might need at mealtime. You can even get an island designed with a pet bed underneath where your dog can sleep at night. Use these kitchen design trends as a jumping off point for creating a dream kitchen that’s also functional, spacious, and beautiful. The ideas presented here give you the very best in aesthetics and functionality to create an amazing kitchen that any homeowner will be lucky to call their own.